Cool, the maple candy pieces are already peaking out. I scrape the lid and am pleasantly greeted by not an eggy flavor, but a maple one. This one might actually be pretty good. Tasting the base is kind of like licking a french toast stick (the kind you find in the freezer aisle). There are nice notes of cinnamon and sugar. The maple swirl is there but is part of the overall flavor profile, it's not completely dominating the show. Whoa, the maple candy pieces are these funky, crunchy, sugary things. I've eaten 1100+ ice creams and I can't think of anything similar. 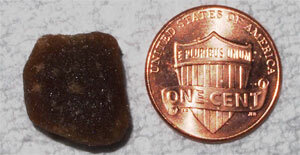 It's like a maple sugar cube. That is cool. In fact, I think I will name him.... #FunFactor. No offense to the fine folks of Perry's, but this flavor is way more fun than their version. Theirs was like the adult version of french toast while this is the kid version. It's not some uber powerful pure maple flavor. It's just having fun with a nice flavor balance. Nothing is going crazy here, but it's still unique. Real fun first impression. Nice job Hood. On Second Scoop: Is this a budget ice cream? Yes. Is it hard to resist once you start crunching in to the maple sugar cubes? YES! I really love the creativity here, and from a budget friendly brand no less. Well done Hood, keep up the craziness. 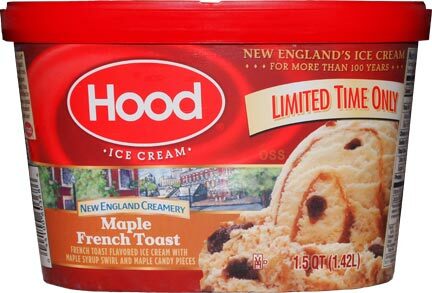 Do you know if Hood is available anywhere on Long Island? I've looked around but can't seem to find it anywhere! This flavor certainly piques my interest (just tried Stop & Shop's Maple Blueberry Pancake, which was surprisingly tasty), and would love to give it a try. 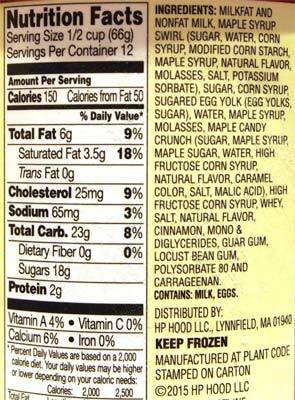 I give them credit for using a unique mix-in like the maple candy pieces because I am sure other brands would have gone with the expected and obvious mix-in of French toast Pieces. Whered you get that penny?! Where's the lincoln memorial?? Granted I haven't used physical money in years but is that a special penny? 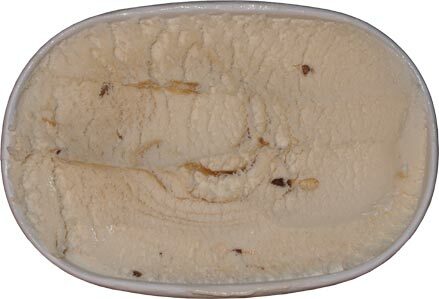 Have you tried the Maple Bacon ice cream from Giant? It's so disgusting! It definitely nails the bacon flavor...Along with the excessive salt. There's no real creamy ice cream flavor to it at all, which is what kills it for me. May as well just be eating bacon. @ToyBox: trying to be more practical this year, gotta get the food budget back in check! Was looking for butter brickle but couldn't find it, so settled for something similar, I thought, but this maple sugar crunchy, creamy flavor was a dream! I hope it stays around!